The list of imprisoned Ukrainians has increased by 14 names. MP Nadiya Savchenko corrected the lists of prisoners she made public on Tuesday, 10 January. The list of imprisoned Ukrainians, whom Ukraine is asking to be released, now contains 14 new names. In addition, one of the persons in the list appeared to be released while two have died in captivity. In the list of the Russian military and the Russians, who are in Ukrainian prisons, six people are now listed as released, and one person as dead. The list reduced by one entry because of a spelling error in one name. 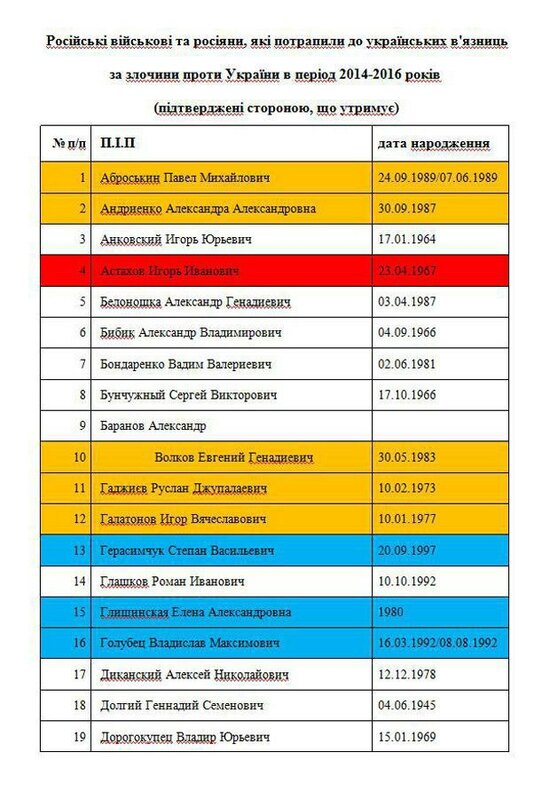 On Tuesday Savchenko published lists of Ukrainians that are being held in the occupied territories of Donetsk and Luhansk regions of Ukraine (confirmed by the party that holds them) - 41 people; lists of Ukrainians, whom Ukraine seeks to be released - 121 people; 524 people who are in the in the "DPR" list; "LPR" seeks the release of 377 people; lists of political prisoners who are in Russian prisons contains 44 people. The list of Russian military and civilians, who are imprisoned in Ukraine for crimes against the country's integrity committed in the period 2014-2016 contains 102 names. A special representative of the Security Service of Ukraine's center for the release of hostages, Yuriy Tandit, has said that Savchenko's lists of prisoners contain incorrect data.